Helping improve collaboration through a detailed understanding of how your Microsoft Teams environment is being used. 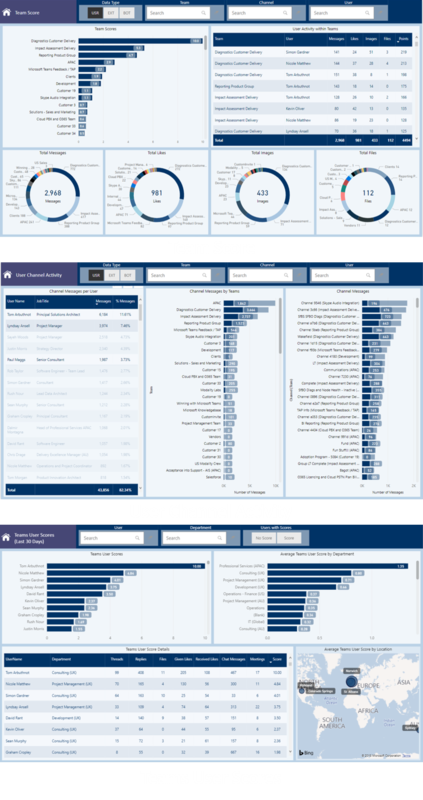 Teamwork Analytics from Modality Systems is a software driven insight tool that proactively measures and collates detailed usage and activity data of your Microsoft Teams environment. Through a series of agile reports, it provides instant visibility of adoption, utilisation levels, trends and actionable insights – helping enterprises drive collaboration improvement initiatives and greater business value. Collaboration between people is the cornerstone to any business. Microsoft Teams provides businesses with a platform to help facilitate improved interactions and team working that can result in a myriad of productivity, efficiency, empowerment and satisfaction benefits for users and business alike. But how do you measure those benefits? How do you know that the tools provided are being optimised by users - or being used at all? Teamwork Analytics from Modality Systems is specifically designed to provide you with the detailed insights of the real activity levels of teams, channels and users beyond basic membership data, enabling you to assess the real success and business value. Teamwork Analytics is a purpose-built solution for Microsoft Teams. It is for organisations who use Microsoft Teams to improve team working and collaborative working throughout (& beyond) the business, adding value to the operational activities and ultimately business results. Teamwork Analytics collects data from Microsoft Graphs API and collates it your Microsoft Azure environment. The data remains in your environment. The data collated includes the native information available through Microsoft Office 365, plus additional data extracted by our Teamwork Analytics solution to provide greater depth of insight. Using the power and flexibility of Microsoft PowerBI, the data is then surfaced in a series of specially designed reports, providing instant access to the insights needed to drive the utilisation and value of collaborative working with Microsoft Teams. PowerBI also provides the ability for the data to be interrogated and filtered in a flexible and agile manner, providing greater insights personalised to your environment. Teamwork Analytics can be consumed on its own or as part of our Teams Success service, providing a range of service wraps to help you interpret and deliver action on the insights. If you would like to experience Teamwork Analytics first hand in the form of access to our demo version, please complete the form below and you will be emailed a link that will provide direct access. If you would like to speak to someone about your specific requirements or pricing, again complete the form and tick the box requesting contact. One of the team will then get in touch with you.